Kachan & Co. helped educate U.S. Senators and Members of Congress this week on alternative nuclear technologies. Cleantech analyst firm Kachan & Co. was among a number of voices in Washington this week advocating American lawmakers support new safer, cleaner nuclear power options in the face of growing Chinese enthusiasm for the technologies. A consortium of nuclear power advocates is concluding a week of briefings today with members of House and Senate energy committees from both sides of the aisle, and members of the bipartisan U.S. Defense Energy Security Caucus. The group’s message: There are safer, cleaner nuclear power options coming available, and while many of them are being developed in America, they stand the best likelihood of adoption and commercialization in China. The consortium is led by the Thorium Energy Alliance, an American advocacy group promoting the benefits of thorium-based nuclear power over today’s uranium, and James Kennedy, president of ThREEConsulting, a consultant on rare earths and thorium, promoting the development and integration of a U.S. rare earth cooperative and separate thorium storage and industrial products company. Lawmakers were given a letter from Dallas Kachan, Managing Partner of Kachan & Co., a cleantech analysis firm that has published a study on new breakthroughs in nuclear power technology. 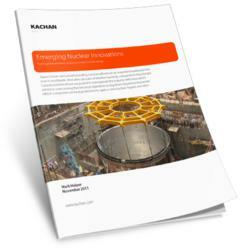 Titled Emerging Nuclear Innovations: Picking global winners in a race to reinvent nuclear energy, the Kachan report was the result of six months of international research. Systems with those benefits are actively being developed, according to the consortium. “Thorium-based systems, originally developed in the U.S., offer the promise of operational safety, proliferation security and near zero nuclear waste,” said John Kutsch, Director of the Thorium Energy Alliance, a longtime advocate of thorium. Kachan & Co. is a cleantech research and advisory firm with offices in San Francisco, Toronto and Vancouver. The company publishes research on clean technology companies and future trends, offers consulting services to large corporations, governments and cleantech vendors, and connects cleantech companies with investors through its Hello Cleantech™ and Northern Cleantech Showcase™ programs. Kachan staff have been covering, publishing about and helping propel clean technology since 2006. For more information, visit http://www.kachan.com. The Thorium Energy Alliance is a U.S. 501(c)3 educational advocacy organization. It is a nonprofit group of engineers, scientists, and concerned citizens interested in reducing the cost of energy and protecting the health of the planet and the future of the race by laying the foundation for thorium-based energy. One of its goals is to restart a thorium molten salt reactor program and the infrastructure behind it. It is holding a thorium conference in Chicago on May 31st, 2012. For more information, visit http://thoriumenergyalliance.com. Lucia Siplakova, Kachan & Co.